The Hawaiian Yellow Fin Anthias is one of the rarest anthias in the aquarium hobby today due to its deepwater habitat and its difficult and expensive capture, but Karen Brittain is now breeding and producing captive specimens for the aquarium trade (as of March 2017). 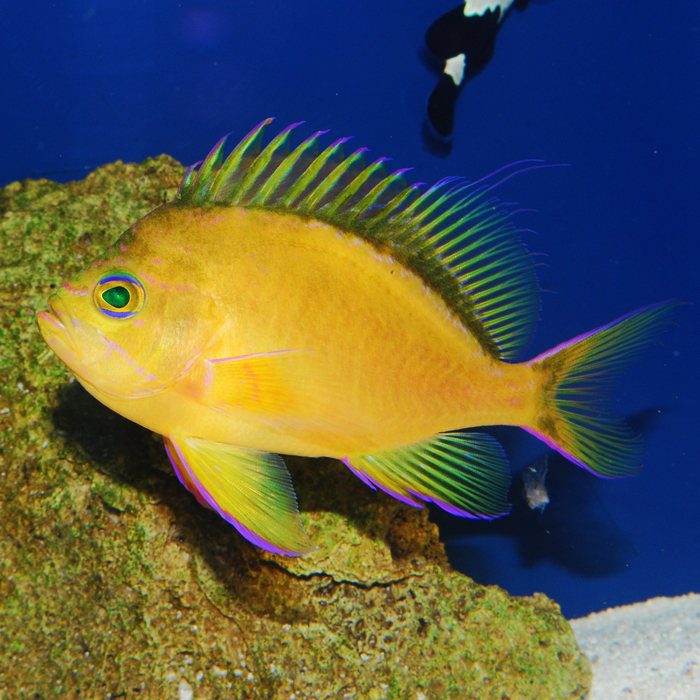 It’s a close relative of the Borbonius Anthias and has similar behavior and habits. The main difference is in its appearance – bright yellow with neon purple lines, edges, and markings. They are often found to be solitary, and so do not need to be kept in a shoal. Generally, it is never found far from a cave or crevice in which it can take refuge. As this is a very deepwater Anthias, it will need gradual introduction to the brighter lights of our aquariums.